Please find below a number of Tutorials which show the capabilities of the different Editions and special functionalities of iModeller 3D. Click through the tutorials online - and please download the provided image files to follow the steps with your demo or full version of iModeller 3D. If you have any questions, please write an email to support@imodeller.com or use our provided Feedback from - our support team will get back to you as soon as possible. 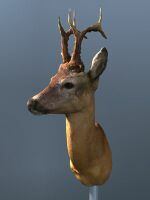 Tutorial 1: A Deer´s Head, Scanned with iModeller 3D Professional Edition and Rendered with Cinema 4D R8! This tutorial shows how fast you can create a 3D result with iModeller 3D Professional Edition, and how you can use this result to create stunning 3D rendering results with Cinema 4D R8. Click here to download the required image files (1,25 MB). 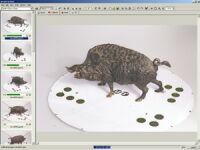 Tutorial 2: A Pig Statue is Scanned with iModeller 3D Web Edition and Published as a HTML File on the Web! Use iModeller 3D Web Edition to create Web3D content almost automatically. This tutorial will show you how. Click here to download the required image files (1,64 MB). 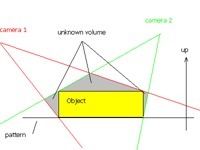 Tutorial 3: How to Remove Cones from Objects. Your 3D model is looking a bit awkward: it does not have a flat surface, a cubic object looks more than a piece of clay? Have a look at this tutorial to improve your results.